You want California drivers ed that’s convenient and comprehensive. Our mobile-friendly course means parents don’t have to drive teens to class, and our bite-sized, interactive content keeps students engaged and learning. Our course is accredited by the California Department of Motor Vehicles (DMV) and completely replaces classroom drivers ed. Certificate of completion included! We're the easy and convenient way for California teens to meet DMV requirements for drivers ed. Gamified quizzes, video and voiceover suit any learning style. Master safe driving through proven education methods that encourage teenage student involvement. This course is much more engaging than your standard driving schools or other online teen driver training. Do everything yourself with easy-to-use tools. When you need us, our knowledgeable team is available on phone, chat or social media every day. We're happy to answer any questions you have regarding your course, the CA DMV, your California permit and much more. Sign up for our DMV-approved online driver education course for students ages 15.5 and up. If you want to try it out first, we offer the first few chapters free! Aceable's course has pictures, videos, memes, voiceovers, text, and pop-up questions – we like to mix it up and keep it interesting. Our California drivers ed course is 30 hours of entertaining content. It's all self-paced so you can start and stop as you like. Plus, it never expires. We'll mail you a Certificate of Completion of Driver Education for free once you're done with the course. Join the thousands of Aceable California drivers who love our course. Study for the DMV permit test with unlimited practice tests in-app. It's important that you prepare for the written exam before heading to the DMV. You'll need to get at least 38 out of 46 questions correct, and you have three chances to pass the test. If you fail, you must wait seven days before taking the test again. Head to the DMV to ace your written test and get your permit! Make an appointment first, because the California DMV doesn't take walk-ins! You'll also need to provide a fingerprint and signature, pass a vision exam, and take a picture. With your California learner permit in hand, you're ready to start driving school. Take your first two-hour lesson with a professional instructor at a traffic school, who will sign your permit. You can't legally drive until you have your first behind-the-wheel lesson with a professional instructor. 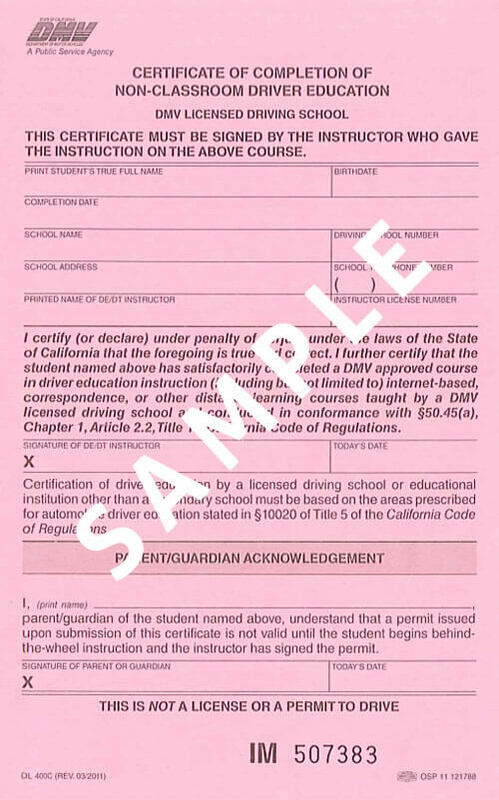 After your first two-hour lesson with a professional instructor, you can start on the 50 hours of behind-the-wheel instruction (10 of which must be done at night) with a parent, guardian, spouse, or adult who is 25 years old or older and has a valid California driver license. You'll need to complete two more 2-hour lessons with a professional instructor (that's six hours total of professional instruction) before you can get your license. Within 6-12 months of getting your permit, after completing driving school, and when you're at least 16 years old, head to the DMV to take the driving test and get your license! If you fail your driving test, you must wait two weeks before you can take it again. You have three chances to pass. When you pass, the DMV will issue you an interim license that's valid for 90 days. Your new photo driver license will arrive in the mail. Until then, always have your interim license with you when you drive. In the meantime, you can't transport passengers who are under the age of 20, and you can't drive between 11pm and 5am. After you turn 18, these restrictions don't apply.